Soak up the beautiful California sunshine at the Capistrano Surfside Inn Resort. The two bedroom one bathroom (“B” Sundowner floor plan) villas are perfect for up to 6 people. These 805 square foot oceanview condo vacation rentals provide queen beds in each bedroom, a queen sofabed in the living room, full kitchen, deck or patio with gas BBQ grill. In addition to the full bathroom, there is a vanity and sink in the master bedroom. The one bedroom one bathroom (“A” Sandpiper floor plan) condos are great for your party of 4 people. These 665 square foot condo vacation rentals provide a queen bed in the bedroom, a queen sofabed in the living room, full kitchen, deck or patio with gas BBQ grill. In addition to the full bathroom, there is a vanity and sink in the master bedroom. Right by the famed Doheny State Beach and Dana Point Harbor, the Capistrano Surfside Inn Resort in Capistrano Beach, offers an enjoyable and relaxing Southern California lodging accommodations. 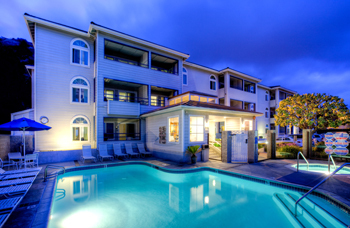 The resort is located in Capistrano Beach, which overlooks the coast on the southern end of Dana Point. Other nearby areas include Monarch Beach and San Juan Capistrano. You’ll find there is a lot to do and see around Capistrano Beach and beyond. Take advantage of the fine Pacific Coast climate to explore many kinds of outdoor activities, visit myriad nearby tourist attractions, or partake of some of the acclaimed local dining and entertainment. Onsite amenities at Capistrano Surfside Inn Resort are listed below. Located nearby, Dana Point Harbor is home to spectacular dining, Ocean Village shopping, and marine activities. All of our 2BR lodging accommodations offer beautiful panoramic Pacific Ocean views. Regular summer rate is about $1400 per week (source: Expedia). Condo views are not known at this time and cannot be guaranteed. Please click here to get your week with Paypal or credit card. Our Capistrano Beach vacation rentals are close to many outdoor adventures. Guests of the Capistrano Surfside Inn Resort enjoy sailing, boating, surfing, snorkeling, tennis, golf, hiking and much more. For ideas of other popular outdoor activities that your family may enjoy, just ask any of the staff at our resort. Iris Street and Ocean Blvd. You’ll have plenty of opportunities for fun and recreation when you choose the Riviera Beach and Spa Resort in Capistrano Beach. Many of these attractions are a short drive away and offer something for just about everyone. For other ideas of attractions you may want to explore, ask our knowledgeable staff. Experience where the magic began at Walt Disney’s original theme park that features eight themed lands with classic Disney characters, favorite attractions, live entertainment, and parades. The Park offers more than 60 major rides, 50 shops and 30 restaurants, as well as night fireworks shows during peak periods. Disneyland is about 31 miles north of the Riviera Beach & Spa Resort. Universal Studios takes you behind-the-scenes and on the sets where movies are made. Be sure to visit LA’s coolest restaurants, clubs and fun at Universal CityWalk, all located 67 miles from our resort in Capistrano Beach, CA. Located 68 miles from our resort, you’ll find all the posh shopping and dining you could ever want in Beverly Hills. For more information, be sure to check out the Beverly Hills Conference and Visitors Center. Located just 37 miles from the Riviera Beach and Spa Resort, this exciting theme park is one of the main tourist attractions in Southern California. The park consists of six themed areas, including Camp Snoopy, Ghost Town, the Boardwalk and more. Besides dozens of rides and attractions, the park also features special live music and theater performances, great restaurants and many shops. Families of all ages love this classic theme park located 60 miles south or our resort. Enjoy live animal shows, educational adventures and one-of-a-kind marine exhibits. This world-famous establishment is clearly no ordinary zoo. Walk or ride a double-decker bus throughout this expansive park, home to over 4,000 rare and exotic animals exhibited in beautiful garden habitats. More than a park, this zoo is a major research facility, although it is cleverly disguised with entertaining shows and inspiring exhibits like Polar Bear Plunge and Hippo Beach. Located 65 miles south of our resort. Near Orange County’s technology hotbed lies this 20-acre site, featuring more than 40 water rides for all ages. The park includes inner tube rides, water slides, wave and activity pools, children’s play areas and much more. This popular summertime family attraction is located just 15 miles from our resort. The Orange County Zoo is located about 28 miles north and focuses on animals and plants native to the southwestern United States.